Maybe my card should say Happy New Year instead of Happy Anniversary? Hey, I don't have a Happy New Year stamp...at least the word "happy" is in the sentiment, right? 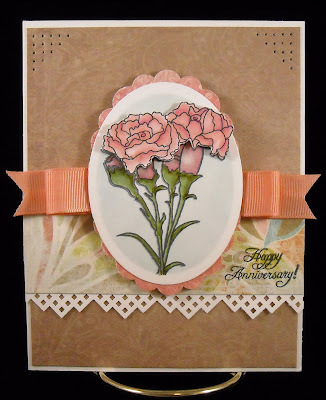 This is another lovely Sweet 'n Sassy set (ahh, floral stamps...my favorite!) that will be released on January 7! (The sentiment is from another SNSS set that will also be released in January) This beautiful carnation stamp also comes along with the word "January"....Humm....I wonder what else Korin has up her sleeve for the January release...Be sure to keep checking back in for more peeks...and more ideas on how to use the new sets! The carnations were colored with Copics and I cut out just the flower portion and attached with dimensional tape for a little pop. And thanks for my new light tent you can actually see that dimension! Have I mentioned that I love my new light tent? :-) And I "stole" this ribbon idea from a card that Julie posted a few days ago. Hi Jules...love your bow! hee hee The ribbon was off-white but I created ribbon to match my carnation and paper by coloring the it with Copics. I also saw a best of 2009 challenge posted on Kelly Rae's blog and thought I'd play along. Best challenge: Hands down...Raising two children will always be the hardest and best challenge ever! Best album: Egads...I don't think I can answer this question since I haven't purchased a new album (or CD) in years! With the exception of some kid's songs...LOL! My husband's new fav is some new John Mayer DVD, which I bought him for Christmas! :-) Best place: Bed! There is nothing like hitting the hay after a long day of breaking up arguments between brothers, making meals, homeschooling, playing with Hot Wheels, building Lincoln Log homes, housecleaning, stamping...You get the picture! I love my bed! Best new food: Humm...This isn't really a new food but it would be the best of this food I have ever eaten. Sushi from Yama Zakura. I kid you not, you have never eaten sushi until you've eaten it at Yama Zakura....This is the most amazing food I have ever had...My mouth is watering just thinking about it... Best change to our home: The addition of curtains to our living room windows...after being bare for the past six months! (Now to paint the walls!) Oh, and the addition of my new craft table to my wee little craft room! Best tea: Sorry kids, Kim doesn't do tea! The best coffee I've ever had is Peet's. Love it! Best word or phrase: Change and hope...That comment would be dripping with sarcasm. :-) Fave new person: How about persons? All of the wonderful people and designers that I've had the privilege to meet this year at either Summer CHA or at the Stamping Around events! I love the crafting world, it is primarily comprised of the most amazing women (and men...Hi Tim!) Wishing everyone a wonderful and blessed New Year! Good morning friends! 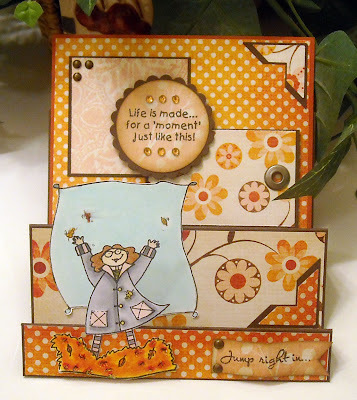 First thing up this morning is news on our next Stamping Around challenge, hosted by Sweet 'n Sassy stamps! 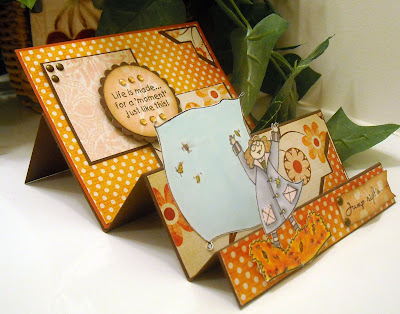 Hop on over to the Stamping Around web site for all the details but basically, if you play along with the challenge you'll be entered into a drawing for a free stamp set, pictured here on my card!! 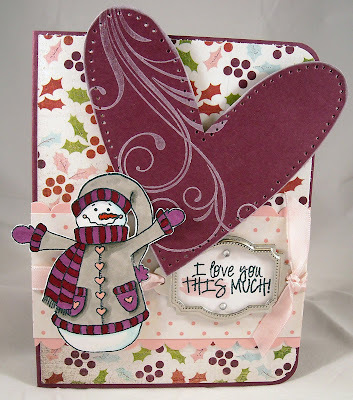 This week's challenge was to use a snowman on a card. This adorable stamp set, Love You This Much, will be available for purchase after January 7, 2009, but I just happened to have this set in my stashed because.... I've joined the design team!!! I was beyond thrilled when Korin invited me to join the team!! 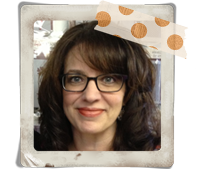 I met Korin at Stamping Around PA and instantly connected with her bubbly personality and fell in love with her darling stamp designs. And after three years working with Odd Bird Planet, I made the decision to step down from designing and managing the team. It's been a wonderful experience but I wanted the opportunity to work with some other teams and when I saw the DT call for Sweet 'n Sassy I knew I wanted to work with their team. We've just gotten started but I'm already so impressed by the way Korin manages the business and team and love the warm welcome I've received from the entire team. I'm looking forward to the next few months....And be sure to check out the other DT blogs that will be listed on the left side of my blog. And what do you think about that picture of my card? Notice anything different?? Notice all the card details? The paper piercing around the heart, depth of the snowman (showing that he's attached with dimensional tape), and brightness of the colors? It's because my hubby got me a light tent for Christmas!! I just about shouted with joy when I opened it! I've been making cards and taking pictures like a mad woman! The difference in the quality of photos taken in the tent and on my bathroom vanity is amazing! LOL! Our family is headed out this morning - in the 14 degree weather - brrrrr....so I'm off! Please stop by the Stamping Around site for details on the challenge!! Is it too far past Christmas to post a Christmas gift idea? :-) I couldn't post this before the holidays as this was for my in-laws and my MIL reads my blog each day (hi Mom!) Speaking of holidays, did everyone have a lovely time? We enjoyed a house full of relatives on Christmas Eve and then had a quiet day at home with just our kids and my 90-something year old Grandmother on Christmas morning. It was a wonderful few days of celebrating! 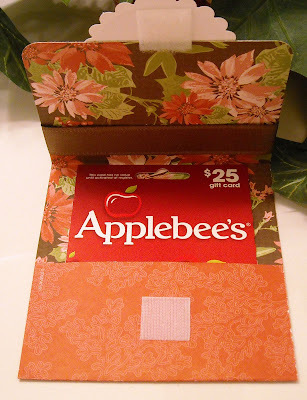 So onto the gift card holder!! I got this idea from SCS, which is a wonderful source of inspiration for anyone looking for ideas. In the forum section there is a search option and I just put in "gift card holder" to look for some ideas on how folks packaged gift cards. 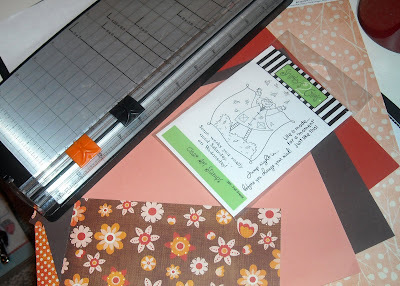 This is a super easy project, made out of just two pieces of patterned paper. I had a few pieces of this lovely holiday paper in my stash from a year or so ago. I love the colors and patterns! 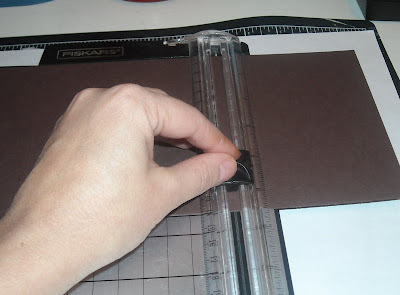 To create the holder I just measured around the card and scored the paper to fold around it. I then added a coordinating piece of cardstock to the front flap. (This paper is double sided so it was easy to get the pattern on both sides). As for my flap image, this is from a Just Rite holiday stamp set that has yet to see ink so how could I resist using it for this project! A big 'ol bow was the finishing touch! Well two pieces of velcro, to hold the flap close, was the true finishing piece! And I think that's all the holiday projects and/or cards I have to share in 2009...Can you believe 2010 is just around the corner? Amazing how quickly (and not so quickly) this year has gone by! Wishing you all a wonderful New Year! 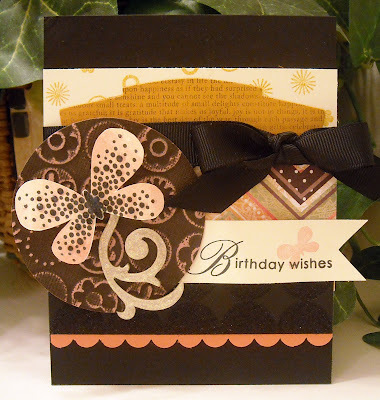 Today's Tip: Use a small and simple designs as the main focal point on cards. This might be one of the quickest cards ever created! LOL! I recently made a scrapbook album (will share more of that later in the week) for a friend who is expecting baby number two in a few months. They know that they're having a girl so I was able to go crazy with the pink in the album and on the card. Love that since I have two boys and everything is our house is in blue! Not much to explain on this card it's so simple! 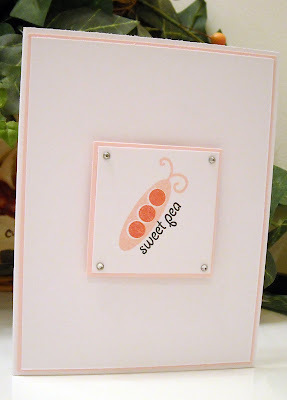 I have multiple layers of white and pink and my non-traditionally colored pea pod image and sentiment is from the Green Thumb set by Papertreyink. I finished off the card with four tiny rhinestones in each corner. My album and card will go home with my Grandmother, who is headed back to NY tomorrow afternoon, so she can forward the gift to our friends. And then we'll look forward to hearing of the new arrival!! Enjoy! This week it was Ruth's turn to set the SALT challenge and she chose Joy in Jesus. Her comments are below: "We often sing these words at this time of year, I would like to take time to reflect on what this actually means. And how the reality of the joy of knowing Jesus can dramatically change the direction of your life.It's my turn (Ruth) to set the theme this week, we're slowly getting back into a routine after the birth of our daughter Mae. I have recently been introduced to the Christian speaker Louie Giglio. If you search for him on You Tube you will find clips. One of his talks is headed Indescribable, he goes into great detail about the Universe, our Galaxy and the size of the stars. They are inspirational messages, that have made me appreciate how great and awesome God is, indeed how indescribable he is. It has reminded me of the humility of Jesus - God's son, in taking on humanity - being human. The even more amazing thing is, he take on 'being human' for a holiday, or for the 'experience' - he did it for a purpose. He had to become human in order to pay for the punishment we deserve for the things we do that we shouldn't, and the things we don't do that we should. Although Christmas isn't a day we are told to celebrate in the Bible, it is a time where we as Christians can stop and ponder and be thankful to God that he came in flesh all those years ago. A time to be truly JOYFUL for JESUS. Have a blessed and peaceful Christmas, from everyone on the SALT team." 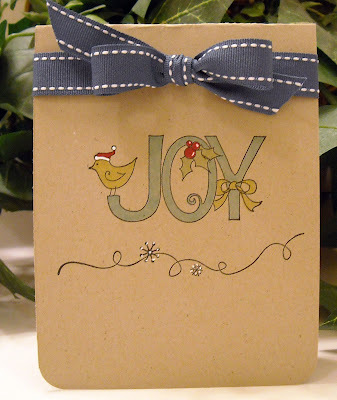 OK...I know, the word joy is no where to be found on my card! I was so lacking in time and, as it turns out, a scripture verse stamp with the word joy in it that I went searching for something else that would work. 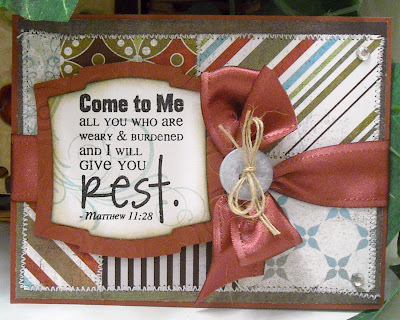 This great verse stamp from Verve made me think of one of the reasons that I have joy in Jesus...He brings rest. Not rest like getting a good night's sleep but rest from the heavy burden of sin. When feeling overwhelmed, wondering why I've yet again lost my patience or spoken in a harsh way, I know that I can bring my burdens to the Lord and tell him how I'm struggling and ask for His help. And I know that help, strength, and encouragement will be delivered. That feeling of comfort, like having loving arms wrapped around you when you're upset, is cause for great joy! If you're walking around today with a heavy burden, I would encourage you to seek Christ in prayer for real, lasting comfort, peace, joy, and rest. Wishing everyone a very blessed Christmas!! Please stop by the SALT blog to see the DT's beautiful work! I was recently inspired by some cards created by Dawn McVey and decided to follow her lead to create a few CAS (clean and simple) cards....this is the first one. I'm finding that I am really gravitating towards a simpler look, not only on my own cards but even what I see on other blogs and galleries. 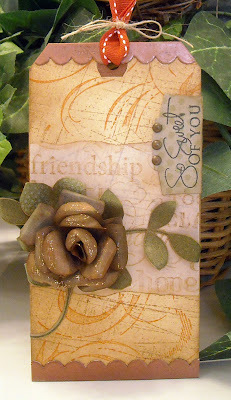 There's always a place and time for the multi-layer, pierced, sewed, and distressed cards (and TAGS!) but for the every day, I love this style. 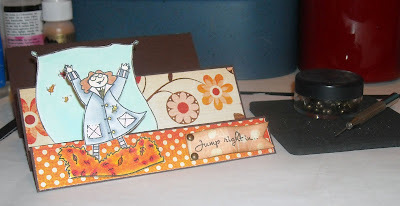 And it seems Papertreyink cards are the perfect stamps for these looks! 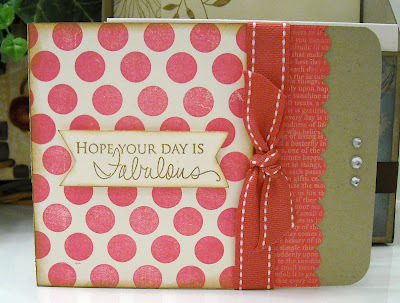 This card is showing three of my favorite sets; Polka Dot Basics II, Text Style, and Signature Greetings. I'm also really digging these bold, bright colors paired with kraft cardstock. I'm in the midst of creating a scrapbook for a friend who is having a baby and decided to use kraft as an accent color vs. white and I love it! 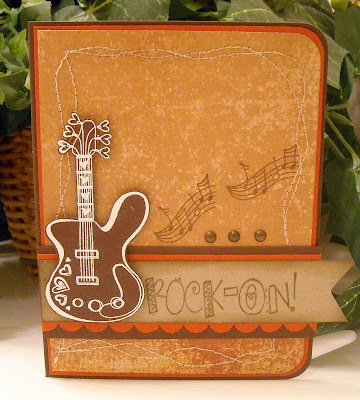 The kraft cardstock is just where it's at! 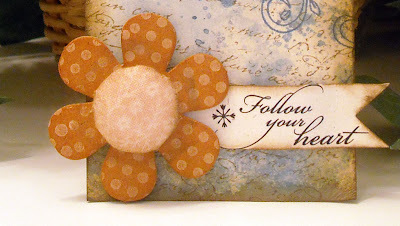 ;-) And...I did add just a wee bit of distressing on the edges of this card...I just can't help myself! Well, just a few days until Christmas and I can't wait!! I LOVE Christmas! My husband went to NY last night to pick up my 90-something year old Grandmother and I expect them back home after lunch. So looking forward to spending the holidays with "Nona" as my kids call her. That and seeing my boy's faces on Christmas morning when they see what's under the tree! Wishing everyone a very merry Christmas! Today's Tip: Take it all off (layers and embellishments that is) and go for one layer! Let's have a show of hands of how many people are ready for Christmas?? I'm in pretty good shape...only one more present to purchase but a whole lot to wrap! I am so looking forward to spending the next two weeks enjoying visiting relatives, friends, and my hubby not working! Today's card is a tribute to the one layer look...perfect when one needs to mass produce! I created these two cards for a few of our neighbors that we're friendly with. The cards accompanied a bag of yummy sugar cookies! 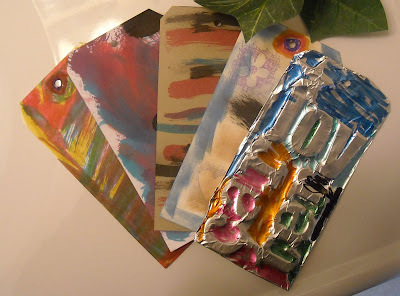 The images used on both cards are from Taylored Expressions and were stamped with Memento ink and colored with Copics. 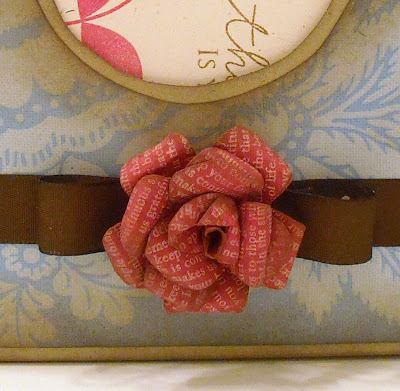 A bow made with lovely Papertreyink ribbon was the finishing touch!! And now I'm off to enjoy a warm evening at home, after watching the snow fall for most of the day. 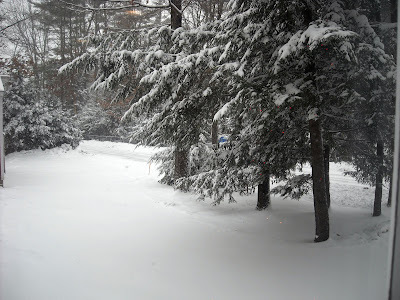 Here's a shot looking out of our living room window...there's a driveway under there somewhere! Enjoy your night! A few months ago some friends of ours told us that they'd like to watch the kids once a month so the hubby and I could have a date night...yippee! Seeing as we haven't been out alone in about eight months, we were more than anxious to take them up on their offer!! A few weeks ago, we finally found a day that worked well and headed out...alone...Turns out we really do enjoy each other's company, it had been so long we forgot how much fun we have together. Guess that's a good thing, seeing as we plan to live together until "death do us part." 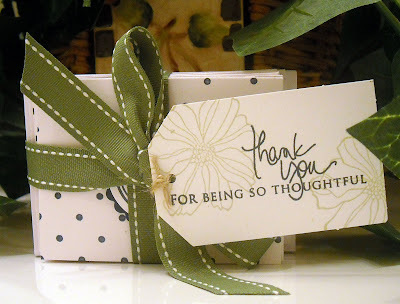 :-) I put together a small thank you gift for them. This mini card set (cards were a little larger than ATC size), which I picked up at Wholly Scrap, was a perfect gift for my friend and her hubby got a batch of some yummy sugar cookies, ala Pioneer Woman style (recipe is from her new cookbook and are the best sugar cookies you have ever eaten!). Since the cards were small I needed to keep the design simple...that and I am forever pressed for time so I needed something I could quickly produce! Four cards were covered in navy polka dots (background stamp by SU!) and layered with a thank you sentiment from Papertrey. The double navy circle is also a stamp from PTI. The second set of cards were embossed with a SU! 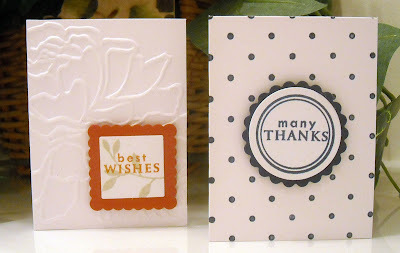 embossing folder and sported a best wishes sentiment with a leafy background, also from PTI. I then stacked the cards and envelopes, and wrapped them up in a piece of beautiful green ribbon from PTI. A tag, stamped with and SU! image and PTI sentiment, finished off my little gift. Now to start planning our next outing...humm....do you think they'd notice if we left the kids with them for a week? Sand It, Tear It, Emboss It! Have you heard about Core'dinations paper yet? Fabulous stuff! It has a colored core so when you tear it or emboss and sand it, like I did on my card, you see a different, coordinating color. And the papers are double sided so if I flipped my black piece over to the pink side and sanded, I would get black sanded edges. You know you're ready to use a product when you're day dreaming about a card design! 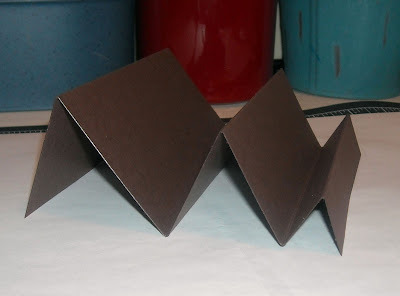 That was me all day yesterday, thinking about a design and how to incorporate the Core'dinations, which I purchased at Wholly Scrap, paper into a card. I opted to go with a small circle vs. an entire card back. The circle was embossed with an embossing folder and Cuttlebug. Then I just sanded the top of the embossed areas. The black came off very easily to reveal the pink below. Cool, right? 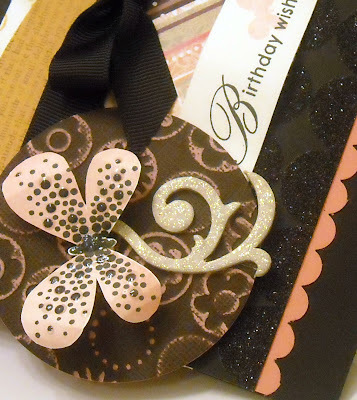 The background decoration of the card is just different colors of cardstock and patterned paper, wrapped with a big 'ol ribbon and bow. 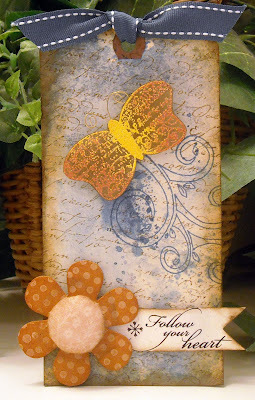 The butterfly is from Papertryink, as is the sentiment (they're part of the same set, Butterfly Kisses). I added some glossy accents to a few of the dots on the butterfly and stickles to the swirl. And how about that black sparkly circle paper? It was a random scrap I found...love that paper! Next I think I'll try tearing the paper to see what I can come up with! If you can find this paper at your local or online scrapbook store, pick some up, it's very fun!! Enjoy! 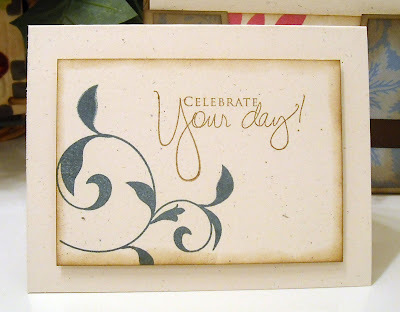 Decorate two front panels with patterned paper Cut a 5 ½” x 4 ¼” panel, layer with patterned paper and decorate with images/sentiment/embellishments – set aside Stamp images three times on white cardstock, color with medium of choice. 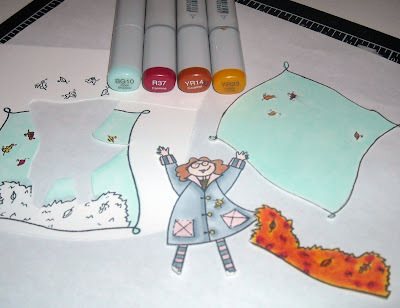 Cut out individual portions of the image (For example, I separated the sections of one stamp and cut out the leaves, the girl, and the background. However, this card could also be created using individual stamps.) Using dimensional tape, attach images to the two front panels. Then stamp sentiment and attach to front panel with brads. Attach third panel, previously decorated, to last "step." 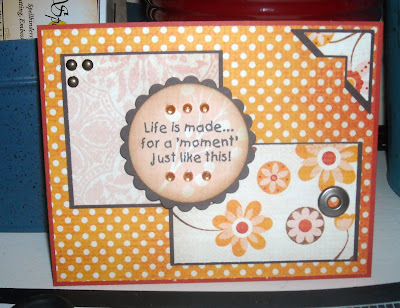 If desired, add other embellishments or Stickles. 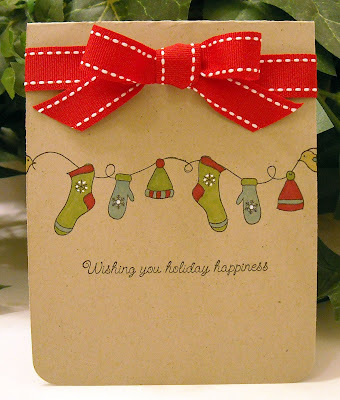 Once card is folded, it will fit into a standard card envelope. Isn't that a fun card design! And it even looks adorable when it's folded. Since I separated each of the elements of the one stamp, when it's folded they all fit back together again. Fun!! I hope you enjoyed today's tutorial and if you're feeling inspired...please leave me a comment with a link back to your creation. I'd love to see your designs! Enjoy! It's been weeks in the works and now Julie and I have announced our plans for the Stamping Around site over the next few months...we couldn't be more excited!! We have frequently stated how grateful we are for all of our amazing sponsors who provide us with door prizes, cardstock, embellishments, and tools. We are continually left speechless by how generous and supportive everyone has been of our events. So starting this month we'll be highlighting our sponsors on the Stamping Around site, one each month. But that's not all....Every two weeks one of our sponsors will issue a challenge. Everyone who participates in the challenge will be entered into a drawing for the stamp set that was used for the challenge!! Check out the Stamping Around site for all of the details and this week's project that sports an adorable set from Sweet 'n Sassy. 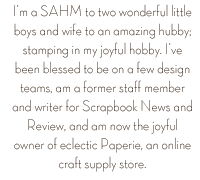 Sweet 'n Sassy is also offering a special coupon for all Stamping Around readers, an additional 10% off already reduced prices (up to 70% off!!) on selected stamp sets. While Julie and I aren't eligible for prizes, we can't help but participate in the challenges!! 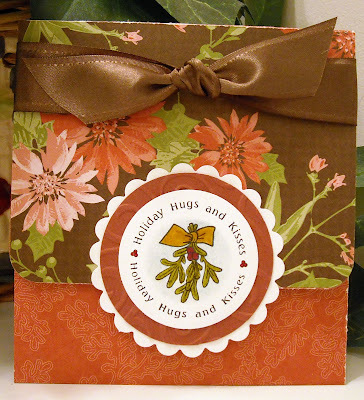 This week's challenge was to create a last minute gift using stamps. 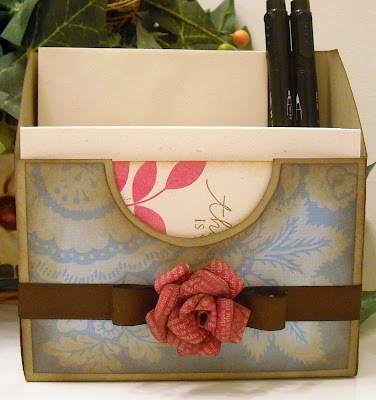 I decided to create this adorable desk set from Papertreyink (it's one of their downloadable templates). I've seen the PTI DT use this as a gift set to hold baby items, a place to hold pens and stamping supplies, etc. I chose to create a stationary gift set that will hold 8-10 cards, envelopes, and a few fancy pens. I might even end up tossing in a book of stamps... The templates are super easy to work with and at only $5.00/template a bargain! 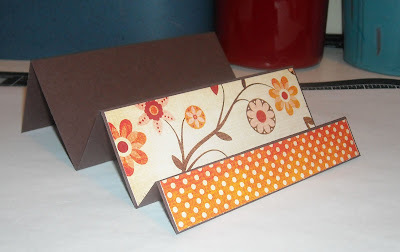 This template used three sheets of 8.5 x 11 cardstock and a few pieces of patterned paper for the front and sides. (My paper is from Amy Butler...don't you just love her patterns?) It took just minutes to assemble. 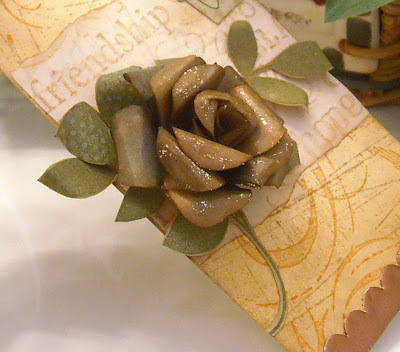 I went with another Tim Holtz inspired paper flower for the front. 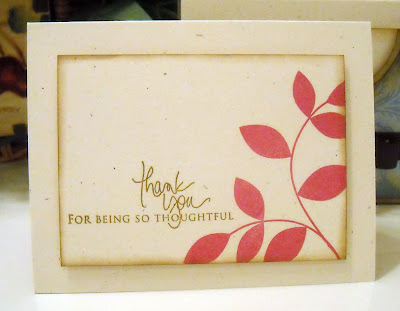 After cutting out the flowers, I stamped them with a text stamp, from PTI, in cream ink. I like the look of the 'wordy' flower! I'm still on the fence on whether or not I need some bling on the front...I think it's crying out for rhinestones! LOL! To keep things simple, since I was mass producing cards, I stayed with a very clean and simple card design. Four cards in a pink ink and four in a blue. The stamp sets used on both cards are from Papertreyink. Aren't the sentiments fabulous? I love the handwritten design. All of my cards are identical, only the sentiment is different on each. This was a really fun project and I think it would make a wonderful gift at Christmas or for any occasion! So are you ready to play along with our challenge?? You have to create a project to be entered into the contest so be sure to head over to the Stamping Around site asap!! It's the big countdown!! The countdown to the last day of Tim's 12 Tags of Christmas! Wow...it has been a wonderful week, I can't believe it's almost over!! It's been so much fun that my oldest has started creating with me...today he made his #3 tag of Christmas! :-) I'll need to get photos of his tags posted, they're adorable. Well let's get down to business, shall we? I've got a lot to share today!! My tag again uses each of the elements that Tim used but in a different way. Tim's tag contains homemade brads, flowers, rub ons, and embossing. Hey, so does mine! :-) My tag background was created like Tim's and I thought I'd briefly share how to create this fun background. You'll need a craft sheet for this technique, which you can purchase at eclectic Paperie (you can actually purchase most Ranger and Tim Holtz products at eP) and two distress or dye ink pads. 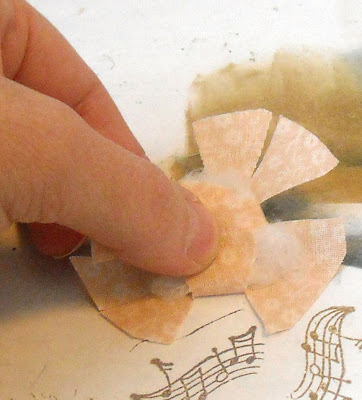 Turn your pads upside down and rub a wide strip of ink directly onto the craft sheet, do the same with the second color, right next to the first. 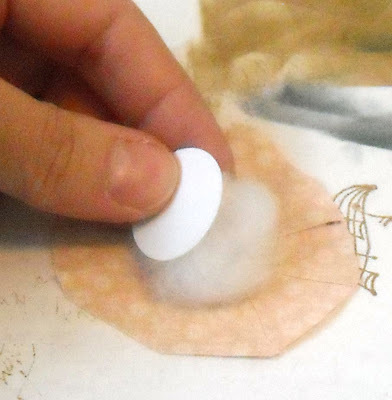 Mist the inks with water until they bead (see above). Place your tag directly on the ink and kind of smoosh it around. Pick it up and dry the tag with a heat gun. You can continue this process until you have the color/look you're happy with. Make sure your tag is fully dry before you stamp. Once my color was on the tag, I added some brown distress ink to the edges, and stamped a script image on the entire surface of the tag. 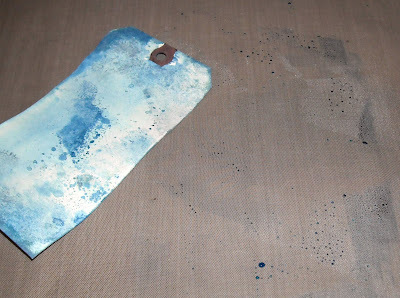 I chose a few Unity images for my tag today and stamped the swirls directly on the tag in a blue distress ink. 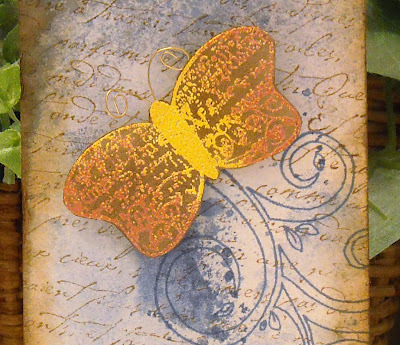 The butterfly was stamped on kraft cardstock and covered with a few different color embossing powders. 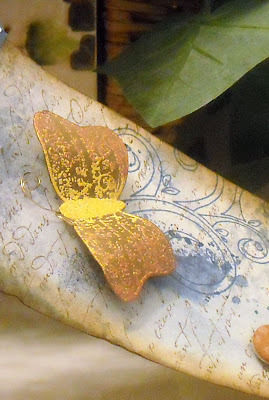 Once the butterfly was embossed and cut out, I filled in the non-embossed areas with brown distress ink. I also replaced the stamped butterfly antenna with wire and attached my finished image to the tag with dimensional tape. I bent the butterfly wings a bit for some fun movement! OK, a show of hands of how many people are still with me...hello....is this thing on... Next up is my homemade brad! Ah, that Tim has been throwing me curve ballss all week...today a custom brad maker, something not in my storage closet. So...I made my own! 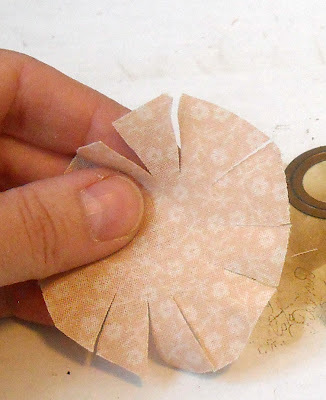 I used a Nestibilities die to cut a small circle out of a heavy duty cardstock and the cut a circle of fabric. 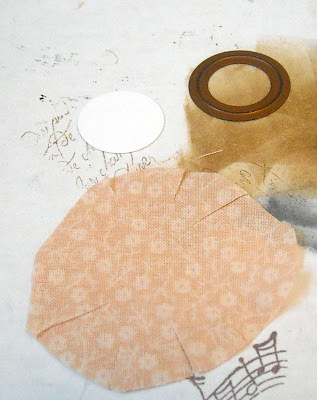 I lined up the cardstock circle on the fabric and cut slits all around the circle of fabric. Next came a small ball of polyfill that was placed in between the cardstock circle and fabric. A little glue or tape on the back of the circle and I pulled the fabric around the circle. Kind of like a fabric covered button...or brad. My finished brad became the center of a chipboard flower. Last but not least...a SU! rub on was added to a paper tag! And that is today's tag...You guys ready for the last day? I can't wait to see Tim's last tag! !